An apple is the sweet fruit produced by an apple tree. It originates from Central Asia and has been grown for thousands of years in Asia and Europe. 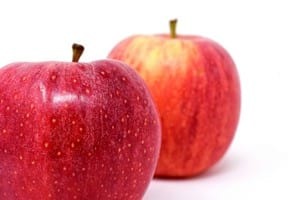 The skin of an apple is generally red, yellow or green. Rabbits tend to have a taste for sweet food and will really like to eat fresh fruit as occasional treats. Apples can be considered as a safe and harmless fruit choice for rabbits. They are, however high in calories as they contain lots of sugar, so make sure to keep the quantity of this treat to a minimum. Note that if your rabbit already has a weight problem, it is best to avoid feeding any type of fruit, including apples. If it is the first time you offer an apple to your rabbit, it is best to introduce the new food slowly in order to allow the digestive system to adjust. Leave a couple of days between offering another apple and keep a watch on the stools. If you see the droppings get soft, stop the introduction and try again after some time. Before feeding the apple, make sure to rinse it with clear running water in order to remove contaminations. A good way to serve the apple to your rabbit is by cutting it up into smaller pieces. As mentioned keep the portions small. For instance, a couple of slices per rabbit per day. If you are wondering whether rabbits can also eat the skin of the apple then the answer is yes. The peel actually packs most of the fibers and vitamins that an apple contains. Next time you are making an apple pie, don’t throw away those skins but keep them as a treat. When offering apples to your bunny, make sure to remove the seeds. The reason for this is that apple seeds contain amygdalin, a sugar and cyanide compound. 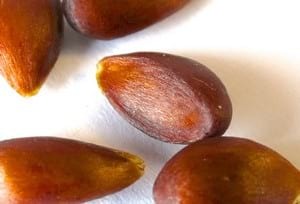 This toxic substance is only present in very small quantities and as such, there is no reason to panic in case your rabbit has accidentally swallowed some seeds. The greater concern would be continuous consumption where the amygdalin was progressively building up in your rabbit’s system to the point of reaching toxic levels. Conclusion: Yes, rabbits can eat apples and their skin, but not the seeds! Does your bunny like eating apples? Let us know by leaving a comment below.